"Hi-Tech Revolution Yo-Yos." A CAD yo made by a manufacturer of radio controlled model cars. Nice yo. Adjustable string gap. ABEC 3 bearing. Revolution Yo-Yos - A division of Team Losi. Inc. 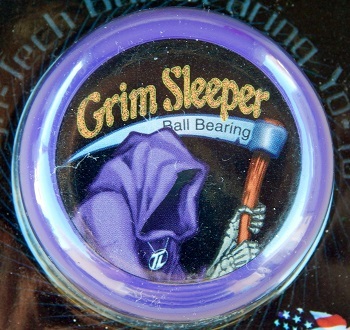 This yo-yo was released in October, 1998 a few weeks before halloween. It is identical in form to the "Da Bomb" yo-yo made by the same manufacturer. Original retail price: $15 US.